The Kennel Club of Fort Atkinson will once again participate in the Furry Friends 5K Run/Walk in support of the Humane Society of Jefferson County. Stop and say “hi” at our booth on Saturday morning, May 18, at the Jefferson County Fair Park. We’ll be ready to provide information about dog training classes and, if you’re interested, membership in our club. We’re always happy to just “talk dogs,” with fellow enthusiasts, too! Register now for Session 2 training classes! Puppy Kindergarten will be offered Monday evenings at 6:30 p.m., beginning April 1st. Continuing Basic will be on Thursdays, beginning April 4th, with class convening at 6:30 p.m. Intermediate Skills will meet Tuesday evenings at 7:00 p.m., with the first class scheduled for April 2nd. Advanced (competition emphasis) will meet Tuesday mornings at 10:30 a.m., beginning April 2nd. Preregistration is required and class sizes are limited. Instructor approval is required for some classes. Click the following links for more information: course descriptions and class dates and registration forms. The Kennel Club of Fort Atkinson’s 25th Annual Spring Fun Match will be held Saturday, April 27, 2019, at the Western Waukesha County Dog Training Club in Ixonia. The Match will be conducted according to AKC rules and regulations, including the new AKC Obedience Regulations which took effect May 1, 2018. 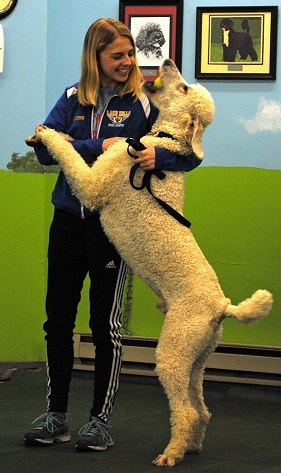 Not only does the annual KCFA Spring Fun Match allow handlers a chance to “tune up” in the show ring, it offers handlers a valuable opportunity to practice the new Obedience exercises outside of a formal trial setting. Advance entries close April 24th.